The NZ Drug Foundation has been at the forefront of major alcohol and other drug policy debates for more than 20 years. During that time the Drug Foundation has advocated strongly for policies and practices based on the best evidence available. Evidence clearly points to road safety challenges related to drug driving. The high levels of cannabis use in New Zealand suggest that cannabis users changing their behaviour with regard to driving following drug use could have a disproportionately positive effect on drug driving prevalence, injury and fatalities. The challenge is that drug users’ perceptions that their drug use impairs driving is low. increase the number of young people who choose not to drive following their own use. We followed the first four stages of our innovative action model and positive youth development principles, involving young people and professionals working in health promotion, drug and alcohol, youth health, road safety and communications for social change. From early 2014 to late 2015, we supported Curative to develop the Steer Clear brand and implement the social marketing plan. This included evaluation advice and ensuring programme elements involved the target audience. We formed the Steer Clear Crew to develop new product ideas and drive audience engagement. 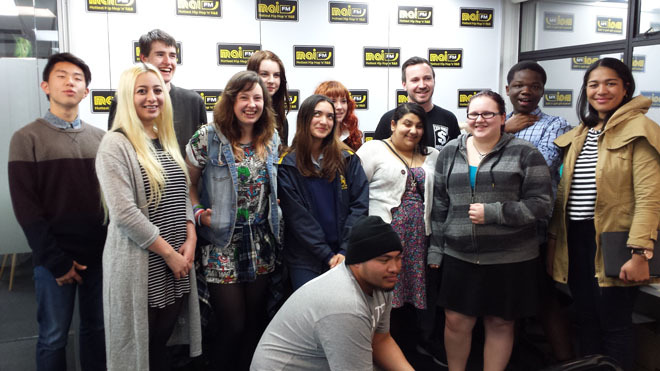 The crew was made up of 16 young people with connections to the target audience. The Steer Clear Crew took part in co-design workshops, conducted peer research, provided user feedback, and helped to promote the programme via social media. Their involvement validated and strengthened the creative development of Steer Clear. A comprehensive social marketing plan to reduce drug related driving harm involving young people in New Zealand. To encourage young people to find safer alternatives to driving high, the campaign uses various integrated components to engage young people, including a full-scale driving ‘Dope as Drive’ experience which is touring through events during 2014/15, a website, social media activity and content, and a radio partnership with Mai FM. Steer Clear won the Ko Awatea International Excellence in Health Improvement award for Citizens at the Centre of Service Re-Design and Delivery at the 2015 APAC Forum. “It shows that it’s not safe to use cannabis and drive”. Most of the Steer Clear Crew changed their attitude during the programme, from not caring about drug driving, to thinking, “it’s a really stupid idea”.